David I. Stagg was a busy man in the 1880s. As Superintendent of School Buildings, he was also responsible for designing them and by now there was a flurry of construction as the public school system expanded. 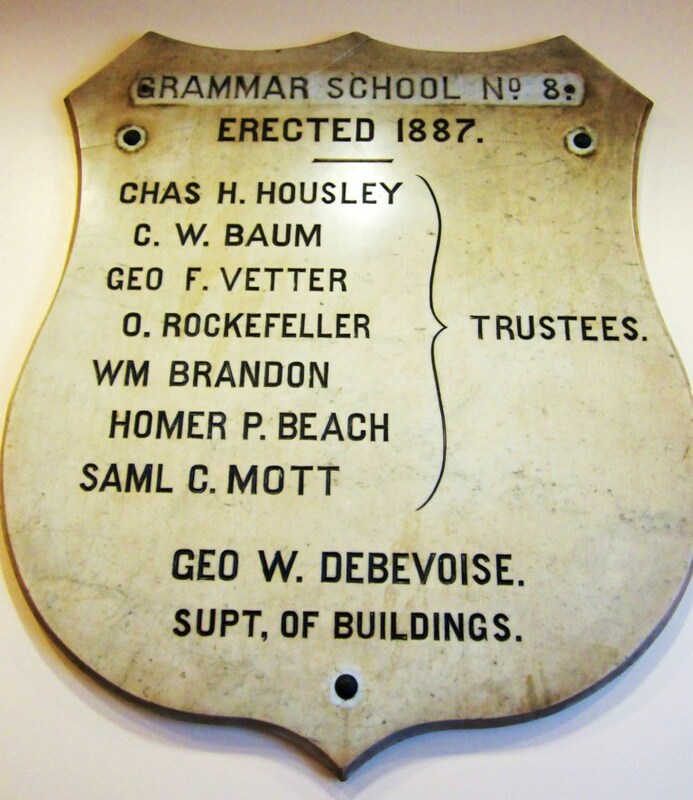 On December 14, 1884 alone he submitted plans for two new school buildings and an addition to an existing one. As commercial interests replaced residential neighborhoods, enrollment dwindled. The population of Greenwich Village, on the other hand, was booming. A row of Federal-style brick houses on King Street were razed to make way for the school and Stagg turned to the trendy Queen Anne style for his dignified, if unexpected, design. Construction began in 1886 and was completed in August of the next year. Three stories of brick sat on a substantial ground floor base of limestone. Stone quoins and window pediments provided contrast with the red brick. Numerous foliate-ornamented brackets upheld the cornice which was broken by a fanciful central parapet over a stone-framed bullseye window. The new school, which cost a total of $250,000, could accommodate 1,200 students. By the time the school was completed, Stagg was no longer Superintendent of Buildings. The school stood out for the academic achievement of its students. Of the fifteen who were presented diplomas in 1893, six of them were slated to enter the City College. The student body, composed entirely of boys, reflected the mixed population of Greenwich Village. 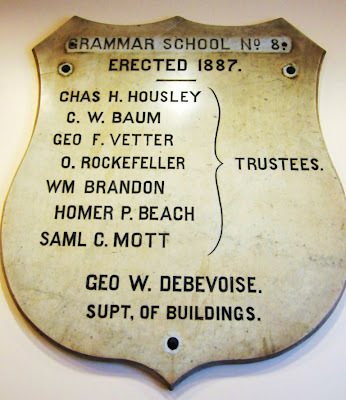 On March 12, 1895 the New York Tribune noted “There are few schools in New-York where the intermingling of nationalities is so marked as in Grammar School No. 8, in King-st., between Macdougal and Varick sts. In this school the American, Italian, Irish, German and Polish Hebrew pupils are pretty evenly divided and form an interesting study to the teachers. “Being on the west side of the city, these pupils are from a comparatively well-to-do class of citizens, and present their several races in a more favorable light than in some other quarters,” the writer said. Dr. Moreau Morris of the Health Department inspected the school in January 1895 and reported “Has the old school sink closets, very offensive. Should be changed for new automatic flush closets. Over 1,200 children in attendance.” Eventually modern plumbing would be installed in the school and the stench of 1,200 children using the outdoor privies alleviated. By 1914 the demographics of Greenwich Village were no longer “comparatively well-to-do,” as they were in twenty years earlier. Sections of the area were among the most impoverished in the city and some boys arrived at school hungry. Social reformers targeted the Village with relief efforts such as Greenwich House where poor immigrant women were helped to better their living conditions. Mrs. William B. Einstein who was President of the Widowed Mothers’ Fund Association started the Penny Lunch Program which included Grammar School No. 8. For one cent the students could purchase a hot lunch in the cafeteria. “For most of these children it is the only hot meal of the day,” she said. Half a century later, in May 1958 the school became The Livingston School for Girls. Despite its high-tone sounding name, it was the last hope for hard-core juvenile delinquents that regular public schools could not handle. The school was termed a “600” school, because its twelve teachers were paid $600 a year more than other teachers—a sort of hazardous duty pay. The Livingston School was the city’s only public school exclusively for delinquent girls. To combat the psychological problems the girls faced, the staff attempted to give them a sense of self-worth. Every girl, for instance, who made the weekly honor roll—based on punctuality, good behavior and five straight days without truancy—was given a corsage. A local florist donated thirty-five of them every week. In 1981 Grammar School No. 8 was converted to 39 luxury apartments. Behind the restored façade, which the AIA Guide to New York City called “a lively Queen Anne,” million dollar condominiums replace the school rooms where immigrant boys learned mathematics and drafting. Wow, Maria, the last 4 paragraphs tells about Livingston School 4 Girls. I attended that school in 1969. Attended P.S. 8 in the early 1940s starting out in Kindergarten with Mrs. Alcott with Principals Mrs. Toothill and Lane. Mostly Italians and Irish students. Teachers were excellent role models in dress, culture and demeanor. Graduated from 6th Grade and on to P.S. 3. Many years later after the U.S. Navy became a university professor. Thank you P.S. 8 for what you remain to me.